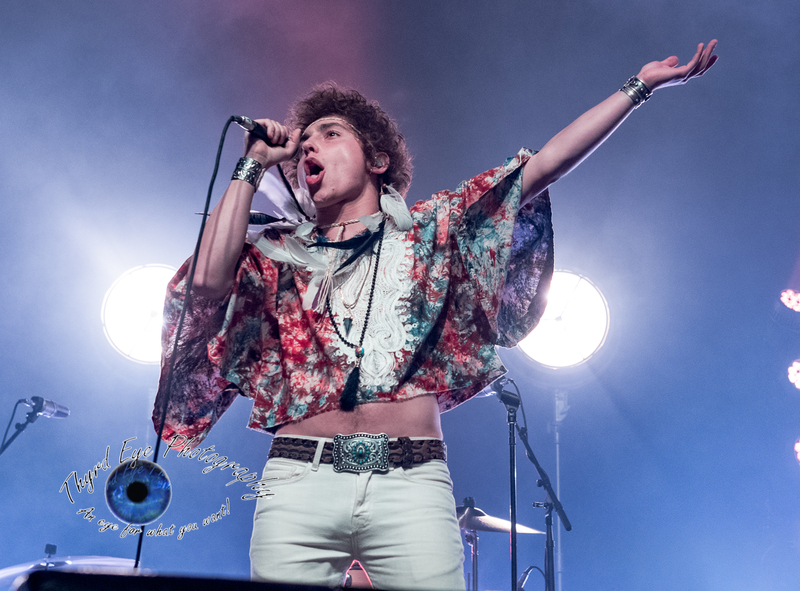 Greta Van Fleet performing at The Pageant in Saint Louis. Photo by Sean Derrick/Thyrd Eye Photography. 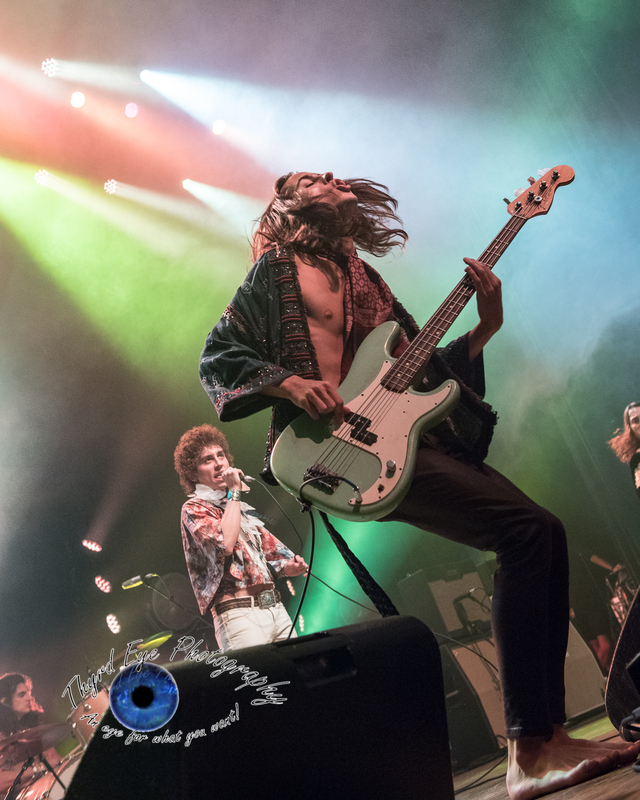 The third time seemed to be the charm for one of the hottest bands in the world right now, Greta Van Fleet. Since the release of their debut ep Black Smoke Rising in April of 2017 (Midwest Rewind was the first to publish a review of that ep, by the way) they have attempted to perform in Saint Louis two other times and both times had to cancel at the last minute due to health issues on both occasions. 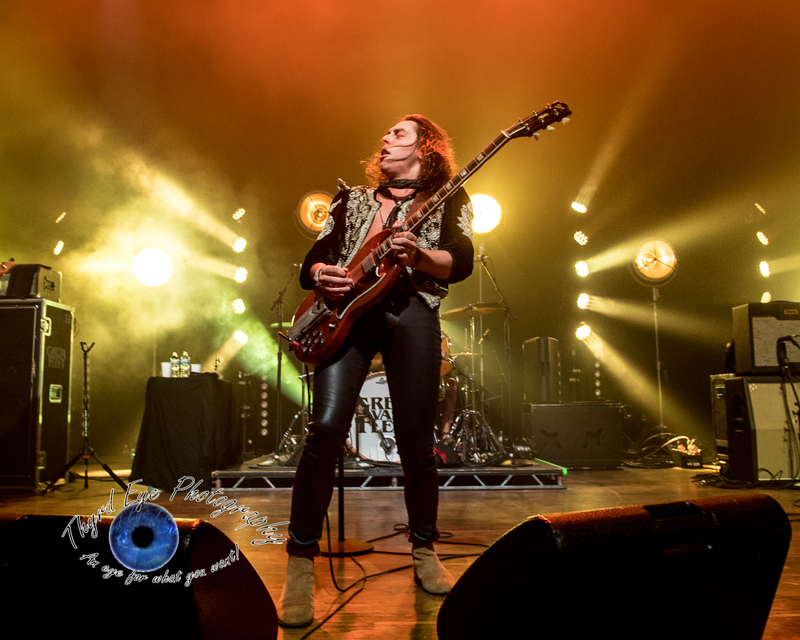 A cancelled show in New York July 29 due to an injury to drummer Danny Wagner put fear in some fan’s minds that the show at The Pageant on Wednesday night would fall victim yet once again. Thankfully, that was not to be the case and the band (finally) was able to perform for the Gateway City faithful. The sold-out show at The Pageant was brimming with excitement and anticipation well before the doors opened as the lines formed around the building with fans hoping to get close to the stage in the general admission floor level of the venue. 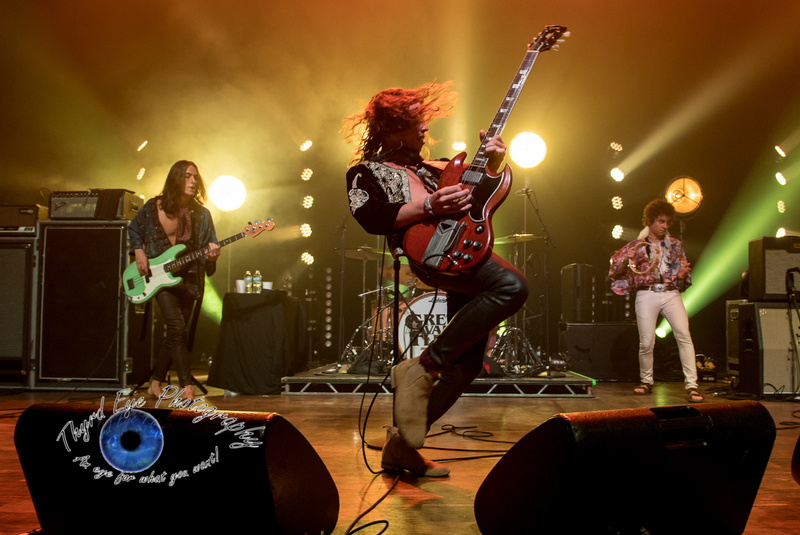 From the first chords of their debut smash “Highway Tune” (A gutsy, but powerful move to put that song first – and it worked) the band (Josh Kiszka – vocals, Jake Kiszka – guitar, Sam Kiszka – bass/keyboards, and Wagner) powered through an intense and blistering set with relative ease. 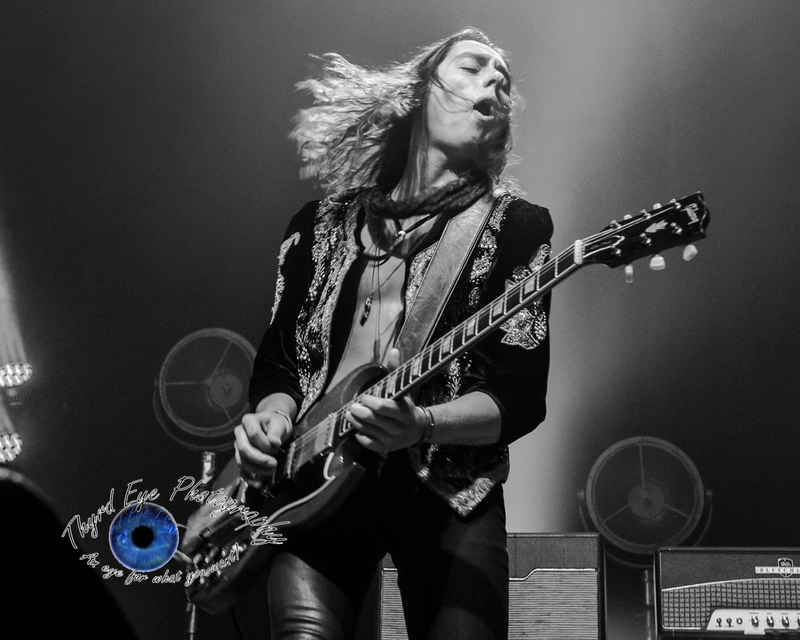 Tearing through guitar driven power songs like “Edge of Darkness” and “Thunderstomp” GVF delivered what many rocks fans are craving: power chords and elongated solos. You know, not the kind of solos that are played at a million miles per hour and you can’t appreciate the notes as they are played. No, I am talking about the kind of solos that grab you by the ears, note for note with power and gusto, digging the chords from way down deep so as to need a back hoe to get down to that level, grabbing your attention and not letting go. Then slaps you back to reality with a booming bass and drum kick out. “Edge of Darkness” did just that as Jake’s solo at the end of the song went on for a good five minutes, not an exaggeration. The encore was superb with the fan favorite “Black Smoke Rising” leading the way. They closed out with and extra song thrown in, a cover of The Beatles’ “Hey Jude” with help from the openers, Cloves. I had trouble finding a downside to this show. The only thing I noticed was I couldn’t understand Josh the few times he spoke only because he was so soft spoken. Maybe it was my ears ringing (through the earplugs, I might add) but I really can’t fault him for that, the kid is not an ego driven person, none of them are, which makes the band that much more likeable. Josh more than made up for his quiet demeanor (again, not really a knock), by belting out great vocals with fantastic sustain. As many baby boomers and X-Gen people like to poke fun and blame Millennials for a myriad of issues (mostly unfair digs) and the state of music today it was refreshing to see that these young men (just barely out of high school) have taken the flame of the future of rock and ran with it. 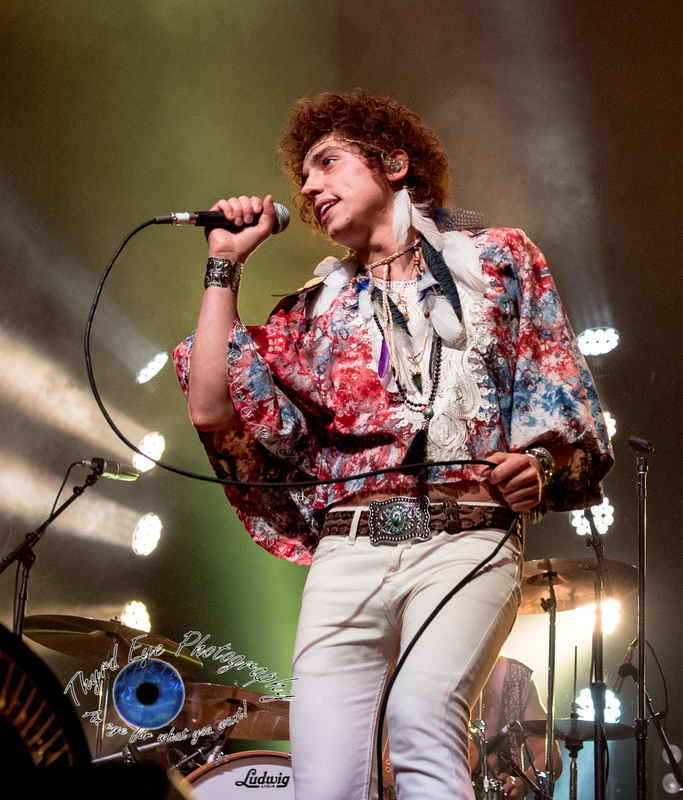 With raw and unbridled emotion, and a grittiness to match, Greta Van Fleet is what rock was meant to be. So, don’t fret rock fans, from the looks of things Wednesday night at The Pageant the future of rock is in some pretty good hands. Seeing this band live is a must for any rock fan’s bucket list. Be sure to check out the gallery of images after the setlist.